In the year 1958 a man named Artur Berlet disappears from the city. After 11 days he returns and reveals an amazing story of an abduction and travel to another planet. He was an employee of the "Municipal Prefecture de Sarandi" - Artur Berlet - and when returning on May 25, said he was abducted by aliens and had traveled to another world. The importance of this case of UFO cases in Brazil is that he was the only abductee who transcribed his entire story on paper and pencil and that was later brought to TV network in Brazil by RBS, were 5 days of recordings in the area of the "rapture". 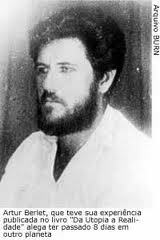 The oldest abduction case registered in Brazil is that of Antonio Villas Boas (see separate article or youtube) in 1957. 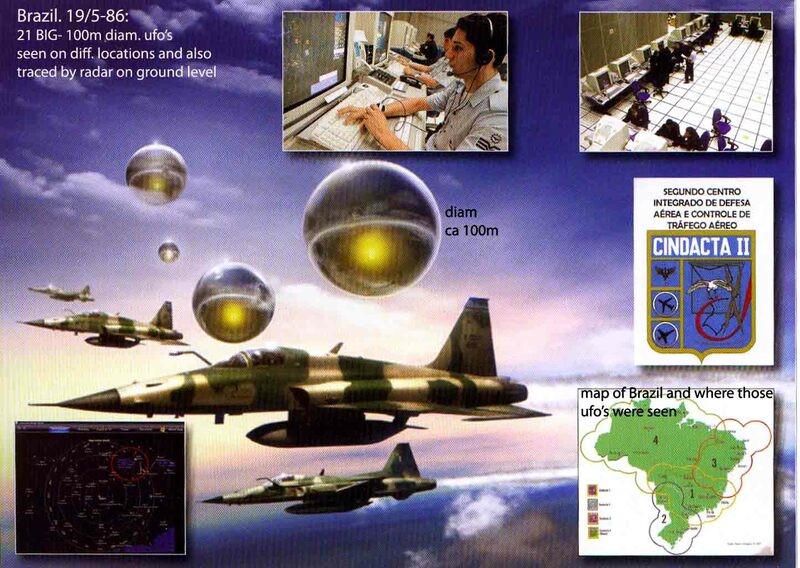 The first reported case of flying objects in Brazil took place in 1952 in Rio and was named "Barra da Tijuca" when a UFO was photographed by the now defunct magazine "O Cruzeiro. Berlet's account, rather gloomy, could be understood only years after the event. Some of the technologies described in the text, appeared years later, such as photocells for converting sunlight, dry food in the form of pills or running shoes with shock absorbing structures and special reinforcements, sound communication and image-telephones (cell phones) and the most impressive, Yuri Gagarin's first trip the day April 12, 1961 or the launch of the first Soviet artificial satellite Sputnik, which was part of the conquest of space that was initiated. How could a simple farmer predict such things at that time? Berlets fantastic narrative came in book in 1969 with help from researcher Walter Buhler and K Macedo Jorge Ernesto Geisel, titled Utopia Records Voador da da Realidade. The book also talked about other technologies that will surely be discovered in the coming/ future years. Berlet was a simple person who disappeared under his photo/film catching in a city of only 3 000 inhabitants. He was 11 days gone in the abduction. Artur Berlet reveals 422 pages written manuscripts what he lived thru, who he met and what he learned, ex. to watch and live with new technologies that after almost 50 years we are still to be discovered here. Berlet died in the decade of the 90ths. The things of life and work of Artur Berlet as documents, personal items, manuscripts, photos, clothing, etc. are located in the International Museum of Ufology in Brazil. A research update on the case of Berlet is being led by Hernan Mostajo, Investigator founding director of the Museum. Artur Berlet tractor Prefecture of Sarandi, Rio Grande do Sul, returning from the interior of the city, traveling either by foot or to ride, when, at 19 hours (7pm), passing by the farm of Dr. Dionisio Peretti, he saw a light by the roadside a few 200 meters from where he was. He crossed the wire fence to see what it was and, reaching 3 m further when he found that the dim light came from a huge circular object, about 30 meters in diameter, whose form resembled two trays, turned against one another. Afraid, he thought about running away, but curiosity was stronger and he took a few steps. Suddenly, there were some figures and a strong jet of light hit him, causing he lost consciousness. To regain consciousness, he found himself tied to a bed - type hospital bed. Some people moved apparently unrelated to his presence. They were high/tall, more than normal on earth, clear, straw-colored hair. Soon after, Berlet was untied by two individuals who raised and led to another compartment, where you wore a long cloak. Always supported the flanks because he felt too weak, the men led him through several rooms to a door. Surprised, he found that the ship rested on firm ground, in a strange city. Helped by two crew members, left the disc and was carried on foot by a narrow street with tall buildings of various colors and intense light, to a large building, where they entered. There, he was fed with a kind of meat and bread. Then he was led into another room, where many people had gathered. After the meeting, this man who could speak only three or four words in German led him to another building. So, Berlet took a bath ”as light as water gas,” donned new clothes they gave him and was taken to a room where several people seated around a rectangular table, talking animatedly. Thereafter this person, named Acorc, became his tour guide, leading him to visit that and other cities Acart (or Akart) - the name of that world - explaining what he saw and wondered. They made clear to him that the planet at that time was 62 million miles from Earth. It has no natural satellites, but has two huge space platforms spinning around. The means of transportation are air. The city is like ours, but the streets are used only for pedestrians. At night, the streets have no need for lighting because of the brightness of the walls. For the transportation of people, they have small ships, with capacity for two to 10 passengers. They are like airplanes without wings, solar-powered engines. Made of lightweight material and super-resistant, can stop in midair and fly it into a roof-top. The heavy duty vehicles are also used in space travel. One year there is equivalent to 676 Earth days, one month to 61 days and 6 hours inland, a week, 9 days and 14 hours, one day, 46 hours, and one hour to 7 hours and 40 minutes. However, they ”know” we will destroy ourselves with our atomic weapons, which will not delay too much and then, without war, without any violence, they could occupy our - then - dead planet. Radioactivity devices could, within minutes, transforming the atomic poison fertilizers to soil, to vegetation and so liveable for living beings. Their arms are just of two sorts: disintegrating and neutralizing thru this "solar-energy-device". The latter also used in medicine and agriculture. On the system of government, Berlet did not know how to qualify it. Said to be a mix of systems with a different name. There is no money in circulation. Its capital, that city where he was, had 90 million inhabitants! All the parents had worked for the community and have a very high standard of living. The governor is elected every three years by a board of 500 members. His host on Acart - the cosmonave Acorc - would accompany him to Earth, and gave him a pill. The pill, which also the crew took, was the only food during the trip. "...he graciously took leave off the disc. Waded 10 steps ahead, without turning, following the recommendation of Acorc. Then he stopped and looked back, hoping to see the takeoff of cosmonave ... Everything disappeared in those few moments! Still obeying acartiano recommendations, he made the entire journey on foot to his home, slowly, taking three hours in this course, which is normally done in one hour only. In the first week after returning, he stayed at home to completely recover the lost energy and to order his ideas confused, troubled by what he had lived eight days in the strangest adventure of his life.